Sorry, I don’t have business cards for these shops but do recommend them. Novita Gifts – in the Alice Springs Mall – is one of the best gifts shops in the Territory and there is a great price range. Takes a while to go through the shop as there is so much to look at and take in. I always find amazing gifts in this shop for people and always get comments on where did I find it! Swank Shoes– Yerrepenye Shopping Centre – this is the flagship store and has a slightly different range to Darwin and a much bigger range of handbags and accessories than what they have in Darwin and I always buy something here when I go to Alice. In fact every woman I know and many others I see, from Darwin, always find time to drop into this store when in Alice Springs for work and many are seen carting a Swank Shoes bag onto the plane home. Hanuman– Crowne Plaza – better in Alice Springs than in Darwin. If you ever have the chance, eat here and skip the restaurant in Darwin. The Darwin one is overrated. Bluegrass Restaurant – yummy food, great atmosphere for dinner and the menu is to die for. Piccolo Puccini– Italian café in an arcade that I think has Sussans in the front of it. I always have a bowl of pasta here for lunch when in Alice – there is a dress shop and a gift shop down this arcade worth having a look at. 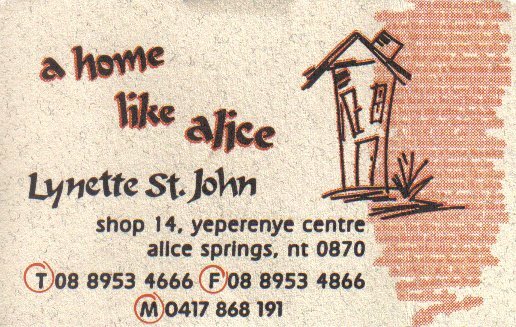 When next in Alice Springs, I hope you enjoy your visit and perhaps these recommendations will assist. This is a little taste of the tropics/ Bali in the desert. Not sure if it still is, but the lady who owns the Swank Shoe stores also owns this store and although the store is somewhat out of the way – it is worth going to have a look and perhaps make a purchase. The furniture is of excellent quality and they also have lots of small pieces for the home. There is also jewellery available for sale. There is quite a bit to look at. 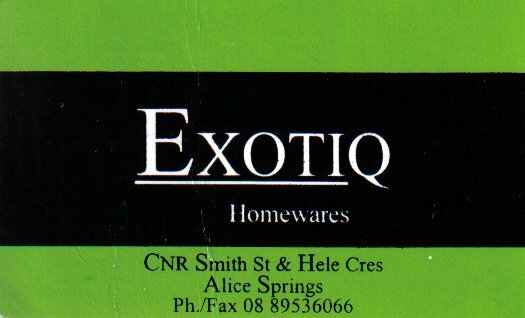 This is a homewares/ kitchen shop and has a good variety of stock. There is also a stock of gift items and have often bought gifts for the present box from here. There is all sorts of kitchen gadgets, Maxwell and Williams and many other well known brand names (just can’t think of them right now – sorry!). This store is next door to Swank Shoes (yes, the original store started in Alice Springs) and there is also a good luggage store, an independent clothing store that can cater for the whole family and also a Woolworths in case you forgot to bring your toothbrush or pyjamas (like I did once in the middle of winter!). I really like this gallery as it is big and there is space to look, admire and appreciate the work on display. The artworks come in all different sizes and prices, making sure there is something for everyone who walks in through their doors. I don’t usually like traditional Aboriginal artwork, I tend to like more contemporary pieces (i.e Sally Morgan) and proudly own a reasonably unique Hermannsburg pot (which has toured the country) and and a beautiful lino print by Connie Lang entitled Wild Bush Flowers (in the right place at the right time). 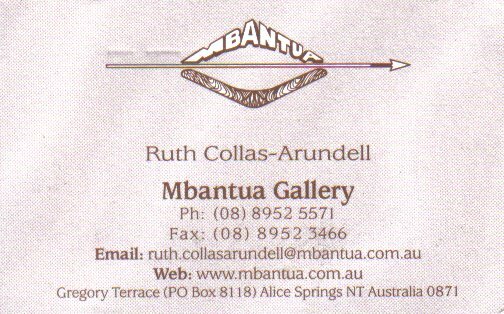 When I was last in Alice Springs, I went into Mbantua and saw and fell in love with three pieces, all dot paintings. The size was perfect to take on board the plane as hand luggage and the store wrapped everything for travelling. The paintings were about the wet season and for some reason they resonated with me, as it reminded me of the view outside my bedroom window in the wet season. They now hang proudly as a feature artwork at the end of my hallway.